(BOWIE, Md.) – Bowie State University joins Coppin State University, Morgan State University, the University of Maryland Eastern Shore and Baltimore City Community College in an initiative to train students in computer networking and cybersecurity, including specialized industry certifications. Last month, Governor Hogan signed the historic SB615 establishing the Cyber Warrior Diversity Program, which will provide annual grants in the amount of $2.5 million each year to Maryland's four historically black colleges and universities and Baltimore City Community College to implement the program. Some expected outcomes are an increase in students training to earn CompTIA (Computing Technology Industry Association) certifications. In a press conference today, Maryland Lt. Governor Boyd Rutherford, along with three university presidents – Drs. 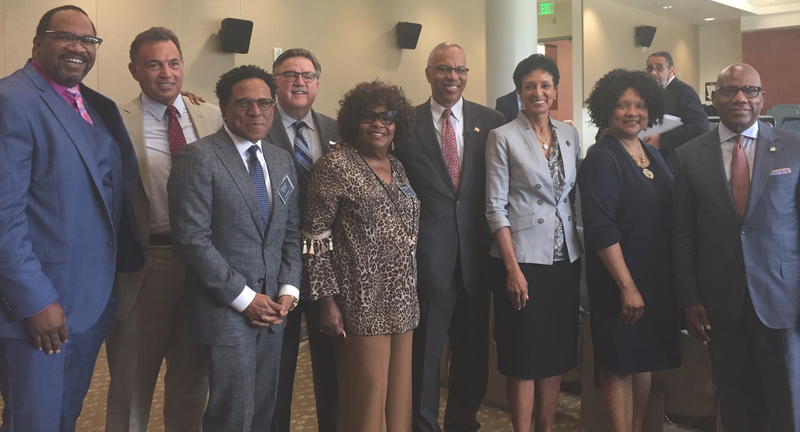 Aminta H. Breaux (Bowie State), Maria Thompson (Coppin State) and David Wilson (Morgan State) – and Maryland Higher Education Commission Secretary James D. Fielder announced the new partnership. One of the bill's co-sponsors, Maryland Senator Barbara Robinson, and representatives from the technology industry also participated in the press conference. “Bowie State University is well positioned to use these new resources to build on the outstanding initiatives we have aligned with the growing and evolving needs within the cybersecurity ecosystem,” said Bowie State University President Aminta H. Breaux.